Well it’s all been pretty much confirmed and after yesterday’s Kroenke news I’ve obviously had my say in yesterday’s blog. This morning I wake up resigned to the fact we are powerless to do anything. There are talks of protests, or not turning up to the first game, leaving the seats empty and showing Kroenke is not welcome. But to me in this new era from a footballing perspective, that would be pointless, but also send the wrong message. There is a time and a place for protests – there will be a time and a place for it – but the first game of the season isn’t it and certainly when the players will need every ounce of support we could possibly muster. So here we are, just under 36 hours until the transfer window closes and whilst this time last week I was delighted that we wouldn’t be involved in any of the shenanigans, it appears as though Arsenal are Arsenal and there are muffled noises about Dembele from Barca, about a clear out of some players like Perez and Welbeck to make room for a signing or two, about what Arsenal might do in the lead up to the new season starting. I for one will be delighted when Friday comes and it’s all about the football talk because right now, the soap opera that is the transfer window is in full swing, and sadly we can’t sit back laughing at everyone else. But do we realistically need players? Defensively I think the answer is most certainly ‘yes’. I think I wi probably do a piece tomorrow about the midfield and attack but as it stands when I look at our back line, I don’t see one of the four best defences in the league. There’s an argument to be had that more organisation from the coaches, more emphasis on discipline and structure in the defence, plus a better level of coverage in midfield, could see us drastically improve on last season. But it’s hard not to look at what we have at the moment and be a little apprehensive. Perhaps I’m just projecting unnecessary fears here, but what I fear more than anything else with our defence is an apparent lack of pace. The Premier League is a fast league. Even the mid table teams have rapid players and if – as looks like it is the case – we start with Mustafi, Sokratis, Bellerin and Monreal (hopefully after this week when he’s fit), then it’s hardly the quickest of back lines. Bellerin seems to have lost a yard or two of pace, Mustafi and Sokratis don’t look the quickest and Monreal is hitting 33 this year. That as a back four playing a high line – not unfeasible given how we know Emery wants to press high up the pitch – has me a little bit worried I must admit. There’s also the question on rotation too. Kolasinac is our for a couple of months and I doubt he’ll be fully fit until November. Maitland-Niles could be an option to come in but again we’re looking at square pegs in round holes. 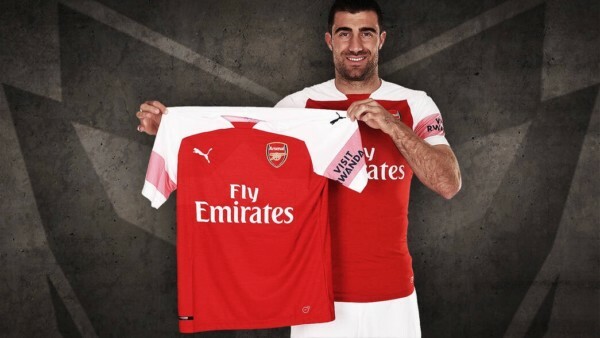 On the right we have the robust Lichtsteiner which I think was a good move for the club to bring in, but if we suffer injuries at centre half as we know we can, we still have two relatively raw understudies to Sokratis and Mustafi, in the shape of Holding and Mavropanos. I, like you I’m sure, was pleasantly surprised by ‘the young Greek lad’ when he played towards the end of last season, but he will need plenty more minutes in the League Cup and Europa League before we can start eulogising about him making it as a first team regular I reckon. There are questions, I have concerns, but what I’m holding on to at the moment is that hopefully all summer has been spent unlearning the general “we don’t really do defence” mentality of the latter parts of the Wenger era. And that is something to be optimistic about. Despite seeing Arsenal in pre season a couple of times, we really don’t know what we’re going to get on Sunday, as people and ex-pros have pointed out; pre season is about fitness and you never really give 100% because you don’t want to get injured. Well, the curtain gets raised on Sunday against the Champions, so that’s when we need the players to kick in to gear and show us some green shoots of positivity that we can glean ahead of the new season. One things for sure, the back line will get their stiffest test of the season on Sunday. We probably need to treat that game in isolation because City are clearly so much better than any other team in the the league but if we can show signs of looking organised, compact when we need to be, not so open on the counter, then there will be plenty of fans leaving the Emirates with a better feeling than the apprehension going in to the game. I’m intrigued to see what the ‘keeper situation will look like as the season unfolds too. It feels like Leno has been brought in as the Cech replacement and my gut tells me that it will gradually happen over the course of the season. I hate to mention that horrible lot on my Arsenal blog but the Tiny Totts did the same thing when replacing Brad Friedel with Lloris. There were questions as to whether Lloris would leave after he didn’t walk straight in to the team but as the season went on he established himself as the number one and I have a feeling that it might be the case with Leno. But it makes sense to start the season with Cech and so I suspect that we’ll see the Czech stopper until at least Christmas. Then it will be a question as to whether Leno has done enough to show he’s ready to become the permanent fixture in between the sticks. To be fair to Cech he looks like he’s bulked up a bit, looks like he’s embracing the competition and he’s made a few good saves in pre season, so hopefully he also feels like many of the players and that there’s a new lease of life at the club under Emery. Not long now before we find out. Back tomorrow with some midfield and front line thoughts.